A scene from the airport of the future: A man's pulse races as he walks through a checkpoint. His quickened heart rate and heavier breathing set off an alarm. A machine senses his skin temperature jumping. Screeners move in to question him. Signs of a terrorist? Or simply a passenger nervous about a cross-country flight? It may seem Orwellian, but on Thursday, the Homeland Security Department showed off an early version of physiological screeners that could spot terrorists. The department's research division is years from using the machines in an airport or an office building - if they even work at all. But officials believe the idea could transform security by doing a bio scan to spot dangerous people. Critics doubt such a system can work. The idea, they say, subjects innocent travelers to the intrusion of a medical exam. The futuristic machinery works on the same theory as a polygraph, looking for sharp swings in body temperature, pulse and breathing that signal the kind of anxiety exuded by a would-be terrorist or criminal. Unlike a lie-detector test that wires subjects to sensors as they answer questions, the "Future Attribute Screening Technology" (FAST) scans people as they walk by a set of cameras. "We're picking up things with sensors that can't necessarily be detected by the human eye," said Jennifer Martin, a consultant to Homeland Security's Science and Technology division. The five-year project, in its second year, is the department's latest effort to thwart terrorism by spotting suspicious people. The Transportation Security Administration (TSA) has trained more than 2,000 screeners to observe passengers as they walk through airports,questioning those who seem oddly agitated or nervous. The system would be portable and fast, said project manager Robert Burns, who envisions machines that scan people as they walk into airports, train stations or arenas. Those flagged by the machines would be interviewed in front of cameras that measure minute facial movements for signs they are lying. Like the TSA's program,FAST raises reliability questions. Even if machines accurately spot someone whose heart rate jumps suddenly, that may signal the agitation of learning a flight is delayed, said Timothy Levine, a Michigan State University expert on deceptive behavior. "What determines your heart rate is a whole bunch ofreasons besides hostile intent," Levine said. "This is the whole reason behavioral profiles don't work." John Verdi, a lawyer at the Electronic Privacy Information Center, calls physiological screening a "medical exam" that the government has no business conducting. "This is substantially more invasive than screening in airports," Verdi said. Burns said the measurements would not be stored and would give a quick read on someone. Previous research, Burns added, has found that people planning to cause harm act differently from the anxious or annoyed. To pinpoint the physiological reactions that indicate hostile intent, researchers have set up two lab-like trailers on an equestrian center outside Washington, D.C. Science and Technology recruited 140 local people with newspaper and Internet ads seeking testers in a "security study." Each person receives $150. On Thursday, subjects walked one byone into a trailer with a makeshift checkpoint. 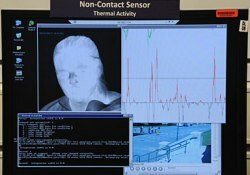 A heat camera measured skin temperature. A motion camera watched for tiny skin movements to measure heart and breathing rates. As a screener questioned each tester, five observers in another trailer looked for sharp jumps on the computerized bands that display the person's physiological characteristics. Some subjects were instructed in advance to try to cause a disruption when they got past the checkpoint, and to lie about their intentions when being questioned. Those people's physiological responses are being used to create a database of reactions that signal someone may be planning an attack. More testing is planned for the next year. Last updated by jack on 28 September, 2008 in Travel.